We arrived at the conclusion that the best results would be secured if 650 pounds per pony were made the maximum weight to be carried on the sledges, this weight including the weight of the sledges themselves, which I have already mentioned was about 6o pounds each. Some alterations were made in the motor-car in order to reduce its weight, all superfluous gear being taken off; and its performances on the sea-ice were so satisfactory that we had high hopes for the future. Before testing the car on the Barrier surface, however, I decided to make a reconnaissance toward the inte­rior, in order to see what the actual conditions were under the low temperature that would prevail. On August 12th, about ten days before the sun returned to us, I started off with Professor David and Armytage on a jour­ney south. We experienced low temperatures and one heavy blizzard. The thermometer often recorded from 50 to 56 degrees below zero, and the discomforts of sledging in the semi-darkness made us appreciate the warmth and light of our little but when we returned on August l0th. The surface of the Barrier seemed to me to be impractica­ble for the motor-car, owing to the tremendously heavy snow­fall, which was much greater than on the Discovery expedition, but I decided to give the machine a trial at a later date. When we three got back from that sledging expedition, the eyes of the members of the expedition who had never sledged opened wide at the appetites we had developed. Porridge, bread and butter, and large quantities of seal-steak disappeared with astonishing rapidity, and after that we were inclined to lapse into a condition of somnolence. As spring approached, more work was under­taken in connection with the training of the ponies. They were made to draw the sledges on which coal was brought from the coal depot, and also ice from a lake about three quarters of a mile distant from the hut, this ice being the source of our supply of fresh water. The dogs I had taken south with the idea of not giving them much serious work, for I pinned my faith to the Manchurian ponies; but they proved very useful, and as several litters of puppies had arrived at the winter quarters, we had a service­able number available for sledging. In view of the low temperature that I knew from former experience prevailed on the Barrier in September, I decided not to take the ponies on the depot expedition, which was to be under­taken for the purpose of advancing stores for the southern journey. We did not want to risk the ponies in preliminary work. 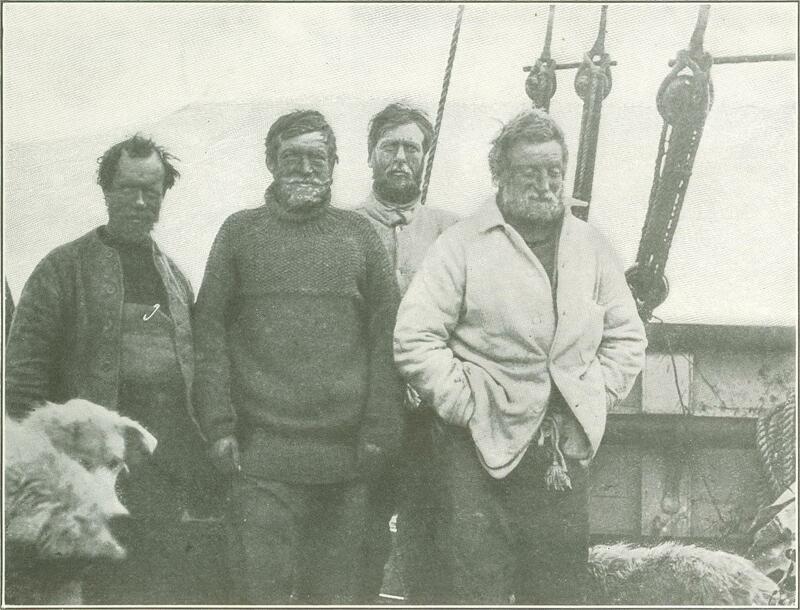 Neither were the dogs to go on this expedition, for the drift, an inevitable accompaniment of southerly winds, would stop them from pulling, and I felt that there might be times when men would be able to travel while dogs would be held up. A party of six men would be able to march in all but the worst blizzards. Preparations went on apace, and by September 22nd we were ready to make a start. I have already made some reference to the sledging equipment, and I will now deal more particularly with this matter. Our sledges had been made for us in Norway, and we were fortunate in securing the advice and assistance of several experienced Arctic explorers. 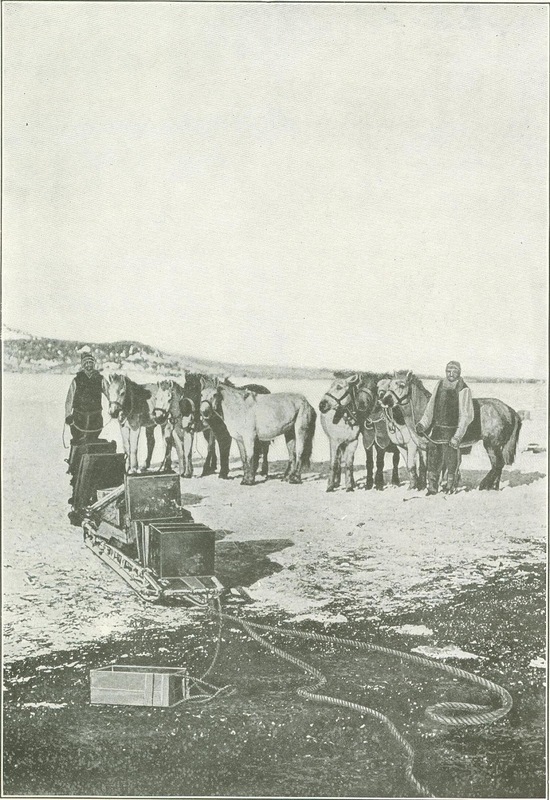 The main requirement of a good sledge for Polar work is that it shall be rigid in its upright and cross bars, and yet able to yield to uneven surfaces; so that when traveling over sastrugi (wind-furrows in the snow) the strain will not be too severe. A good sledge is so supple that it will have an undulating, almost snakelike movement over rough snow, and there was nothing wanting in our sledges in this respect. The wooden runners were about four inches wide, and were made of specially selected hickory, split with the grain, and the frame gave a clearance above the snow of six inches, which has been found to be ample for all practical purposes. The parts were held together by rawhide lashings, and the only rigid portions were the junctions of the uprights and cross-pieces, where there was a short iron stay. After our experience on the Barrier ice with the Discovery expedition, we had decided to dispense with metal runners, as these are not satisfactory on snow. The harness for man haulage consisted of broad canvas bands which went round the hips and were held in position by straps across the shoulders. This harness was fastened by lines to a wooden span attached to the bow of the sledge; it was simple and light, and was easily taken off. It served as a safeguard when any member of the party chanced to fall through the lid of a crevasse, and this was an important consideration. On the depot journey in the spring we decided to take two three-man sleeping-bags, for, in the very low temperatures we expected to experience, the warmth of one another's bodies would add to our comfort during the sleeping hours. A part from this, the use of a three-man bag is attended with disadvantages, such as the possibility of one man snoring and disturbing his companions; moreover, sometimes a sudden desire would seize one man to get a little more air, for at night the opening of the bag would be closed, leaving only a narrow slit for the admission of air, and occasionally a feeling of suffocation ensued. The attempt to get a breath of fresh air would mean the admission of an icy-cold blast, and the indignation of the other two men can be imagined. The object of the depot journey, it will be understood, was to place a store of pro­visions at an advanced point south, in order that when we started out on our attempt to reach the Pole we might be able to leave that point with the full quantity of sup­plies. We decided that the best stuff to put at the depot would be pony maize, because there was always the possibility that we might not be able to find the depot again, and the loss of the maize, though a serious matter, would not have been fatal to the work of the southern party. We started from the winter quarters on this depot journey on September 22d, the party consisting of Adams, Wild, Marshall, Joyce, Marston, Day, and myself, with a load of about 170 pounds per man. We reached latitude 79° 36' south, a distance of over 120 geographical miles from the winter quarters, laid the depot, which will hereafter be called depot A, and with hard marches returned to the but by October 13th. 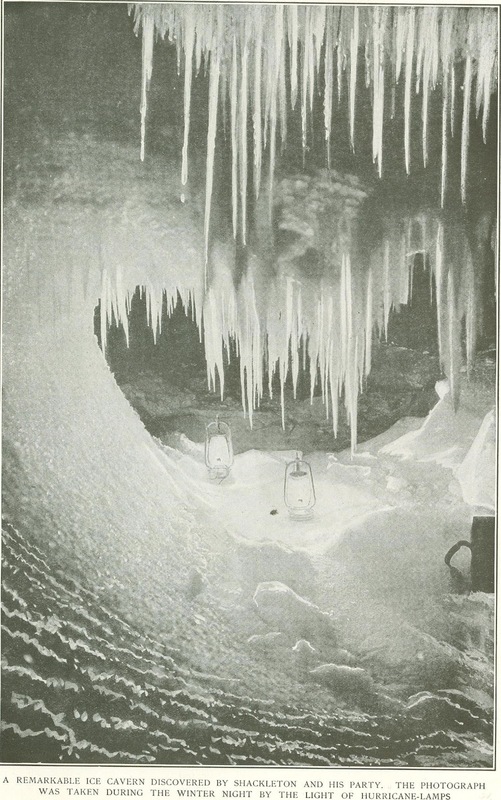 At different stages of the journey, owing to blizzards, we were laid up in our sleeping bags, unable to march, for seven days and a half, and very low temperatures pre­vailed. At times the petroleum for our stoves was practically frozen, and at other times it could only be poured out as a creamy fluid, for all the world like condensed milk. We made very good time coming back, and arrived at headquarters with the usual sledgers' appetites. 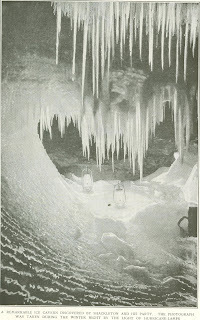 By this time the party at the hut had been reduced in numbers, for Professor David, accompanied by Douglas Mawson and Dr. Mackay, had started on the long northern journey that resulted in the attainment of the Magnetic Pole. I said good-by to them on September 22d, 1908, and it was March, 1909, before I saw them again. When we had returned from the depot journey and had recovered from the lassitude that follows severe work on the ice, we became still more active in the training of the ponies and dogs, and made short journeys to Hut Point, where we stored the provisions that we proposed to take with us on the journey south. 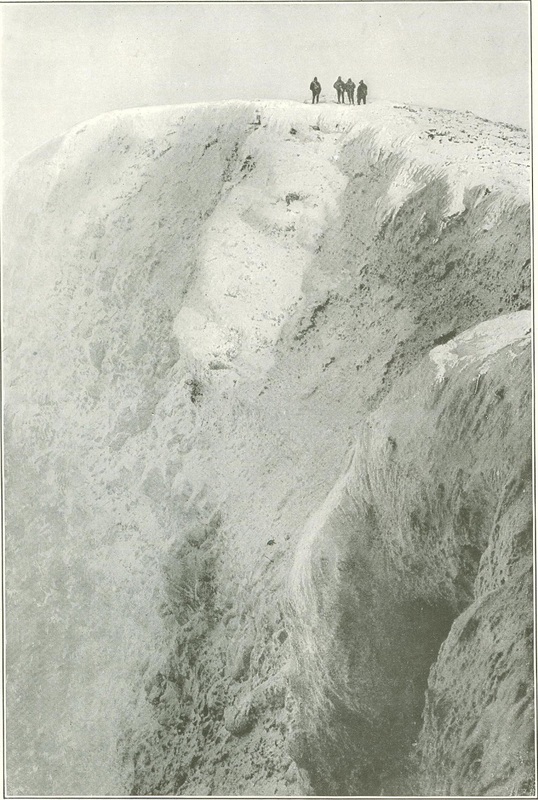 Hut Point, which lay about twenty miles south of us, was the spot at which the Discovery expedition wintered in 1902. The Discovery's hut, as I have mentioned, was still standing, and it made a very good short distance depot, and was often a welcome shelter from the bliz­zards that swept down on that portion of McMurdo Sound. By the middle of October we had secured definite information regarding the capabilities of the ponies, and the question of the food sup­ply for the sledging journey had been settled. Dr. Marshall had studied carefully the relative heat-giving and fat-forming values of our provi­sions, and the ration had been fixed at thirty-two ounces per man per day. 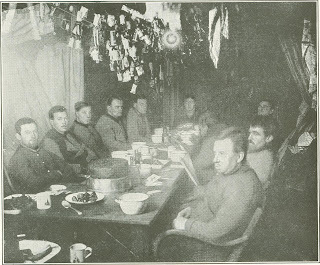 We had decided that the food supplies for the southern party should consist of sugar, pemmican, biscuits, cheese, plasmon, chocolate, tea, cocoa, "emer­gency ration," and "emergency Oxo." Sugar, which has great heat-giving properties, was an important item. The biscuits weighed about twelve to the pound, and were made of whole meal, with 25 per cent of plasmon added. The pemmican was made of the best part of beef, ground down and mixed with 6o per cent of lard. There are many kinds of pemmican on the market, but that procured for the expe­dition from Copenhagen was particularly good. The plasmon powder was added to our tea, and we found it a valuable preparation. The "emergency ration," which consisted of crushed bacon, peas, and beans, was added to pemmican and powdered biscuit to make "hoosh," the chief item of the limited menu. We had hoosh in the morning and evening, with biscuits; and the chocolate and cheese, also with biscuits, were used on alternate days for lunch. We drank tea at lunch and cocoa at breakfast and dinner. I decided to take eleven-foot sledges, this length having proved to be the most satisfactory. We had only four ponies left, for of the eight landed we had lost four through their eating sand - a loss that was very unfortunate. We decided to take no heavy cloth clothing on our journey. Each man's outfit of garments consisted of two pairs of Jaeger pajama trousers, singlet, shirt, guernsey, Burberry overalls, ten pairs of heavy socks, three pairs of finneskoe, Balaclava cap for the head, with Burberry covering, large muffler, and fur mitts, hung from the neck by pieces of lamp-wick so that they would not be lost when taken from the hands. With this outfit we were absent from the hut for one third of a year. Washing is not possible on a sledging journey, though at the winter quarters we were fairly reg­ular in our ablutions. The second pair of pajama trousers was intended to put over the others when we got into low temperatures. We selected one-man sleeping-bags, so that each man had a refuge of his own inside which he could write his diary and look at his Penates and Lares. As regards instruments, we had a small, compact theodolite, weighing with the tripod about eighteen pounds, prismatic compasses and ordinary small compasses for checking our course as we marched, boiling-point thermom­eters to determine altitude, aneroid barome­ters, spirit thermometers graduated down to 100 degrees below zero, tables for working out observations, protractors, and dividers. All these items, with a supply of note-books, were stored in one box, which weighed about forty pounds. We also had sledge-meters by which to determine the distance traveled day by day. It was on October 28th that the southern party left the winter quarters at Cape Royds and started on the long journey toward the Pole. We were four strong, Dr. Marshall, Adams, Wild, and myself, and the distant goal of our ambition was, of course, the Pole itself, though we were not unmindful of the value of the general information that we might be able to secure. We had provisions for ninety-one days, with pony rations for a lesser period, and we reckoned on being able to use the ponies for food as they became exhausted or their food supply gave out. We were accom­panied by a supporting party provisioned for fourteen days, my idea being that it could accompany us for nine days and return in five days; but bad weather caused me to send it back sooner than I had expected. Hut Point was our first camp, and we did not get away from there until November 3d, owing to one of the ponies having gone lame while crossing the sea-ice. Soon after this our difficulties commenced. The snow was soft and the ice full of crevasses and a blizzard swept down upon us. On November 7th we were in a maze of crevasses off White Island, only thirty miles south of Hut Point, and I ordered the return of the supporting party to winter quarters. Our comrades cheered us on our way with hearty handshakes and good wishes, and it was with mingled feelings that we watched them start on their journey back to comparative comfort and plenty. The weather cleared for a short time soon after this, and we were on the march when one of the ponies, which was being led by Adams, stepped on a hidden crevasse and went down to its middle with him in the soft snow. The position was acutely dangerous, because the treacherous snow-lid might have broken away altogether at any moment and precipi­tated pony and man to death far below. 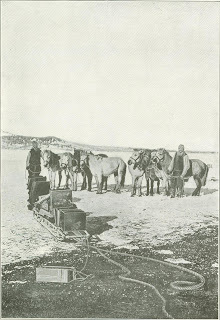 Wild, who was traveling behind with another sledge, came to the rescue and enabled Adams to haul himself and the pony out just where the crack opened into an apparently bottomless cavern. What a remarkably narrow escape from losing Adams, the pony, and half our provisions. After this we camped for two days until the weather cleared. The traveling was terribly hard when we resumed our journey. The apparently level plain over which we were making our slow way proved, on closer acquaintance, to be seamed in every direction with crevasses, often lightly covered with the new snow, and the keenest vigilance was necessary in order to avoid accidents. Presently we got on to the great snow-plain, swept by the wind into furrows, or sastrugi. We reached depot A on November 15th, and took with us part of the stores placed there by the depot expedition. Each day was much like the one that had gone before. We turned out of our sleeping-bags at twenty minutes to five in the morning, and had breakfast – consisting of hoosh, biscuits, and cocoa - at six. The preparations for the day's journey were rendered difficult and slow by the low temperature, and it would be eight o'clock before we were able to get on the march. 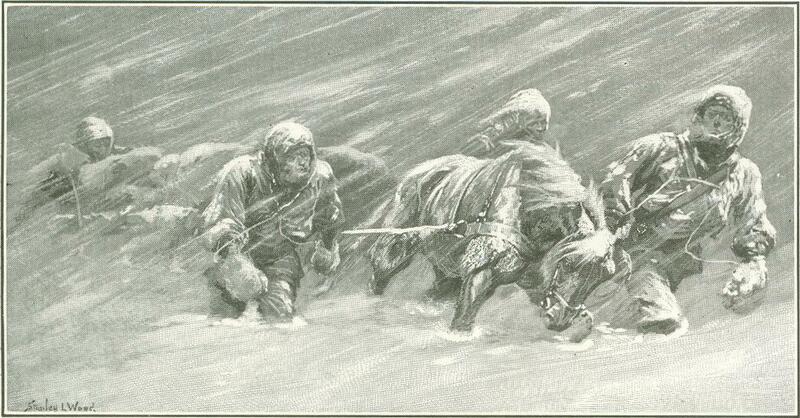 Tents had to be struck, ponies harnessed, and sledges packed; and then we would start south again, traveling in single file through the soft snow. Each man led a pony, and we took turns at traveling in front and breaking the trail. At the end of each hour there would be a five minutes' spell. We would stop one hour for lunch, and would camp for the night at 6 P.M., having been nine hours on the march. It was a regular routine, unbroken by incident, and saved from monotony only by the fact that we were working hard and ever moving south. The ponies received first attention when we pitched camp. They were brushed, covered with their cloths, tethered to a steel wire stretched between two sledges, and fed. 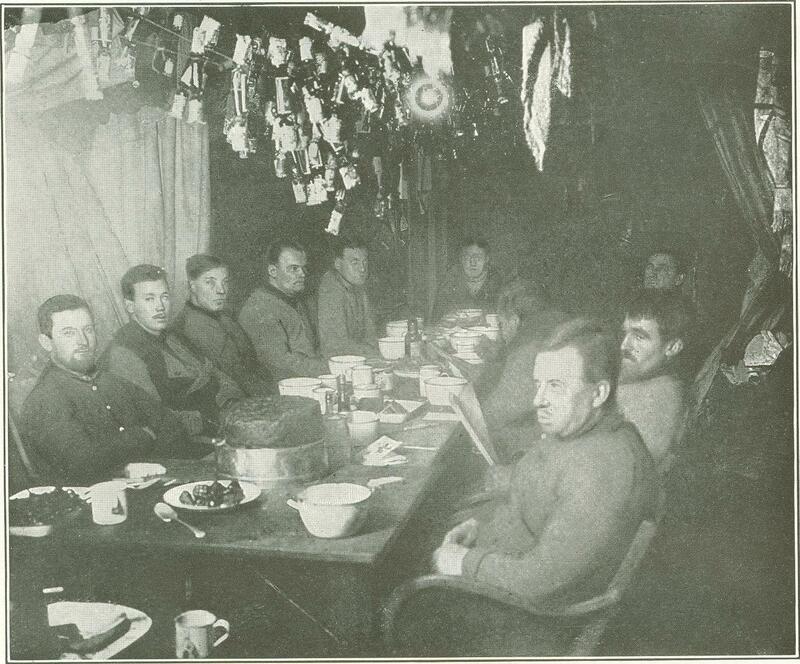 The pony rations consisted of maize and "Maujee ration," a mixture of dried carrots, currants, sugar, plasmon, and meat, and they were given ten pounds a day each. Indeed, if a pony showed signs of hunger after having finished this allowance, it was given a little more, for we did not stint the animals at all. We fed them well and treated them well as long as pos­sible, and, when their food began to run short, killed them in merciful fashion, the carcasses providing food for our own consumption. While the ponies were being "bedded," the cook for the week was busy preparing our evening meal. The tents would be pitched, and the cook would take possession of one, which later would have special attractions as a sleeping-tent on account of its comparative warmth. A cooker, filled with snow, would be handed in, and the cook would proceed to make hoosh over one of the Primus stoves. The happiest period of the day was when we sat round the stove inside the tent and ate our warm meal, preparatory to creeping into the sleeping-bags, writing up our diaries and notes, and dropping into the deep sleep that is born of utter physical weariness. The second depot was made in latitude 81° 4' south, at a point about eighty-eight miles from depot A, and there we killed a pony. The rations for the ponies were running short, and, moreover, we wanted fresh meat for the depot and to carry with us. We held a consultation as to the amount of food to be left behind, and used a sledge to mark the spot, sinking it into the snow so that about eight feet projected above the surface of the barrier. A bamboo pole with a black flag on the top was lashed to the sledge, but of course we were dependent largely on observations of the surrounding country for the location of the depots, since the sledge and flag could be seen only a short distance. We left pony meat, a tin of oil, and a supply of biscuits at the depot, and we aimed at establishing a similar one at every hundred-mile stage of the journey, so that there would be enough to see us through on the way back. On November 22d we saw new land for the first time, a range of mountains, ice-covered and stern, with here and there a peak of bare rock. It falls to the lot of few men to get so far from the beaten paths of the world as to discover land not previously seen by human eyes, and it was with feelings almost of awe that we gazed across the snow-plain at those distant peaks. 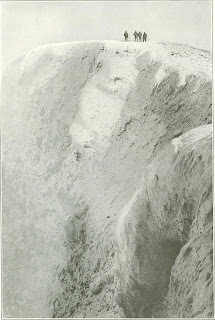 The trend of the mountains was about south­east, but our pleasure in our discovery was somewhat damped by the knowledge that if the range continued in that direction we would be unable to march due south on the level surface of the Barrier, but would have to find some way up the mountains if we were to attain the Pole. On that day we did over fifteen statute miles, in spite of a head-wind and the worst surface we had yet encountered, the snow being so soft in places that the ponies sank up to their bellies. In the space at my disposal in a magazine article I cannot deal with many of the incidents of the journey, such as the gradual rising of new land, the tortuous traveling amongst the ice-chasms, the narrow escapes from disaster, and the ascent of the mountain, which we felt justified in calling Mount Hope, for from here we saw the great glacier which we thought would lead us to the Pole itself. On closer acquaintance this glacier proved to be as full of pitfalls, chasms, and trouble as it well could be. I must pass on quickly to the day on which we began the ascent of this glacier, for I decided that this road of inland ice offered the only way of passing the mountains and getting south. We made our way on to the glacier through a gap in the mountain range which we called the "Southern Gateway," and, as soon as we began the ascent, found a great difference in the distance we were able to travel daily. On December 6th we spent from 8 A.M. until 2 P.M. traveling 600 yards, for the surface of the glacier was honeycombed with crevasses, some hidden under the snow, some gaping open, but all dangerous. When we looked down into the blue-black depths of those caverns, no bottoms could be seen, and a false step on the part of any one of us would mean death and a severe blow to the hopes of the expedition. We were unable to take the sledges over these crevasses with full loads, and so had to "relay" our food and equipment, while at each journey the runners of the sledges suffered from the sharp edges of the ice. I can best describe the days that followed by giving extracts from my diary. December 7th was nearly a tragic day for us. "Started at 8 A.M., Adams, Marshall, and myself pulling one sledge with 450 pounds, and Wild leading Socks behind," I wrote in my diary. "Slopes of very deep snow, into which Socks sank up to his belly, and we plunged in and out continually, making it very trying work. Passed several crevasses on our right hand, and could see more to the left. The light became bad at 1 P.M., when we camped for lunch, and it was hard to see the crevasses, as most were more or less snow covered. After lunch light better, and as we marched along we were con­gratulating ourselves on it, when suddenly we heard a shout of 'Help!' from Wild. We stopped at once and rushed to his assistance, and saw the pony-sledge with the forward end down a crevasse, and Wild reaching out from the side of the gulf, grasping the sledge. No sign of the pony. We soon got up to Wild, and he scrambled out of the dangerous position; but poor Socks had gone. Wild had a miraculous escape. He was following up our tracks, and we had passed over a crevasse which was entirely covered with snow; but the weight of the pony broke through the snow-crust, and in a second all was over. Wild says he felt a rushing wind, the leading-rope was snatched from his hand, and he put out his arms and just caught the farther edge of the chasm. "Fortunately for Wild and us, Socks' weight snapped the swingletree of the sledge, so it was saved, though the upper bearer was broken. We lay down on our stomachs and looked over into the gulf, but no sound or sign came to us; a black, bottomless pit it seemed to be. We hitched the pony-sledge to ourselves, and started off again, now with a weight of 1,000 pounds for the four of us. Camped at 4 P.M., very tired, having to retreat from a maze of crevasses and rotten ice on to a patch where we could pitch our tent. We are indeed thankful for Wild's escape. When I think over the events of the day I realize what the loss of the sledge would have meant to us. We would have had left only two sleeping-bags for the four of us, and I doubt whether we could have got back to our winter quarters with the short equipment. Our chance of reaching the Pole would have been gone. We take on the maize for ourselves to eat. There is one ray of light in this bad day, and that is that anyhow we could not have taken Socks on much farther. We would have had to shoot him to-night; so that although his loss is a serious matter to us, for we had counted on the meat, still we know that for traction purposes he would have been of little further use. When we tried to camp to­night, we stuck our ice-axes into the snow to see whether there were any more hidden crevasses, and everywhere the axes went through. It would have been folly to pitch our camp in that place, as we might easily have dropped through during the night. We had to retreat a quarter of a mile to pitch the tent. It was very un­pleasant to turn back, even for this short dis­tance, but on this job one must expect reverses." On December 9th I wrote: "Another splendid day and much we needed it, for we have had one of our hardest days’ work and certainly the most dangerous so far. Started at 7.45 A.M. over blue ice, and in less than an hour were in a perfect maze of crevasses, some thinly bridged with snow and others with a thicker and there­fore more deceptive covering. Marshall went through one, and was only saved by his harness. He had quite disappeared down below the level of the ice, and it was one of those crevasses that open out from the top with no bottom to be seen, and I dare say a drop of at least 1,000 feet. Soon after Adams went through; then I did. "The situation became momentarily more dangerous and uncertain; the sledges, skidding about, came up against the sheer, knife-like edges of some of the crevasses, and thus the bow of the second sledge, which had been strained when Socks fell, gave way. We decided to relay over this portion of the glacier until we got on safer ground, and it was well past eleven before we got both sledges on to better ice. Camped at 11:45 to get the sun's meridian altitude and to save time while watching the sun's rise and fall, decided to lunch at noon. The latitude we found to be 84° 2' south, which is not so bad considering that we have been hauling our heavy load of 250 pounds per man uphill for the last two days. "At noon we were nearly 2,500 feet above sea-level. In the afternoon we had another heavy pull, and now are camped between two huge crevasses, but on a patch of hard snow. Camped at 6 P.M., very tired and extremely hungry after dragging uphill all afternoon for over five hours. Eight P.M.: Now 3,000 feet above sea-level. Low cumulus clouds hanging in the south, as they have done for many days past, obscuring any view in that direction. Anxiously hoping to find soon a level and inland ice-sheet so that we can put on more speed. Distance to-day 11 miles 1,450 yards. Talk now is mainly about food and things we would like to eat, and at meal-times our hoosh disap­pears with far too great speed. We are all looking forward to Christmas Day, for then, come what may, we are going to be full of food." These altitudes and any future ones quoted from the diary are uncorrected for temperature and comparison with the base station. It was not until we returned to winter quarters that the corrections could be made, and eventually we made a reduction in the various heights. "Our distance - three miles for the day ­expresses more readily than I can write it the nature of the day's work," I wrote on December 12th. "Started 7:40 A.M. on worst surface possible. Sharp-edged blue ice full of chasms and crevasses, rising to hills and descending into gullies, in fact, a surface that could not be equaled in any Polar work for difficulty in traveling. Our sledges are suffering greatly, and it is a constant strain on us both to save the sledges from breaking or going down crevasses and to save ourselves as well. "We are a mass of bruises where we have fallen on the sharp ice, but, thank God, no one has even a sprain. It has been relay work to­day, for we could only take on one sledge at a time, two of us taking turns at pulling the sledge whilst the others steadied and held the sledge to keep it straight. Thus we advanced one mile, then we returned over the crevasses and hauled up the other sledge. Repeating this to-day for three miles gave us nine miles' marching over a surface where many times a slip meant death. Still, we have advanced three miles to the south and tonight we are camped on a patch of neve. By using our ice-axes we made a place for the tent. "The weather is still beautifully fine, though low clouds obscure our horizon to the south. Marshall is putting in the bearings and angles of the new mountains; they still keep bearing to the west and east. Distance, 3 miles 500 yards; with relays, 9 miles 1,500 yards." "We made a start at 7:20 A.M.," I wrote on December 17th, "and had an uphill pull all the morning over blue ice with patches of snow, which impeded our progress until we learned that the best way was to rush the sledges over them, for it was very difficult to keep one's footing on the smooth ice, and haul the sledges astern over the snow. "By I P.M. we had done eight miles of this uphill work, and in the afternoon we did four more. We had worked from 7:23 A.M. until 6:40 P.M., with one hour's rest for lunch only, and it seems as though twelve miles was not much, but the last two hours' going was very stiff. We had to take on one sledge at a time up the icy slope, and even then we had to cut steps with our ice-axes as we went along. 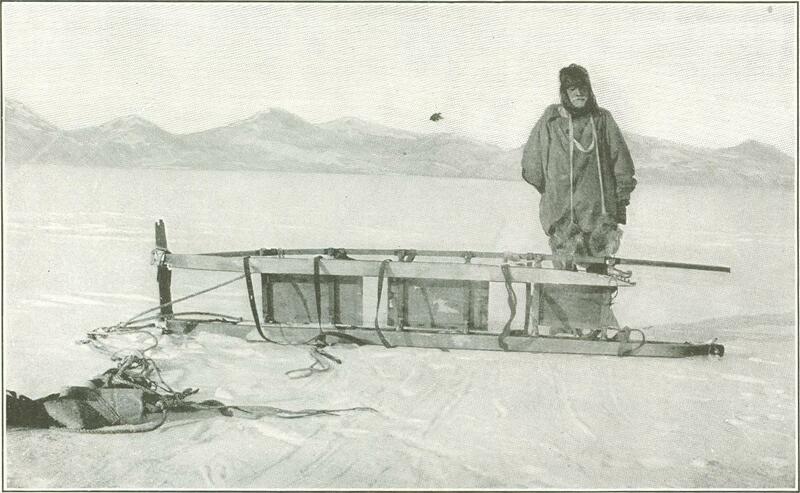 "The work was made more difficult by the fact that a strong southerly wind was dead in our faces. The second sledge we hauled up the rise by means of the Alpine rope. 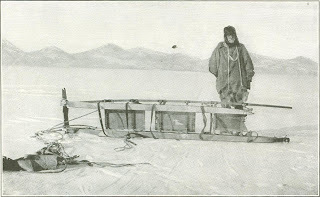 We made it fast to the sledge, went on with the first sledge till the rope was stretched out to its full length, then cut a place to stand on, and by our united efforts hauled the sledge up to where we stood. We repeated this until we had managed to reach a fairly level spot with both the sledges, and we pitched our tents on a small patch of snow. There was not enough of the snow to make fast the snow-cloths of the tents, and we had to take the gear off the sledges and pile that round to supplement the snow. "We have burned our boats behind us now as regards warm clothing, for this afternoon we made a depot in by the rocks of the island we are passing, and there left everything except the barest necessaries. "After dinner to-night Wild went up the hillside in order to have a look at the plateau. He came down with the news that the plateau is in sight at last, and that tomorrow should see us at the end of our difficulties. He also brought down with him some very interesting geological specimens, some of which certainly look like coal. The quality may be poor, but I have little doubt that the stuff is coal. If that proves to be the case, the discovery will be most interesting to the scientific world. Wild tells me that there are about six seams of this dark stuff, mingled with sandstone, and that the seams are from four inches to seven or eight feet in thickness. There are vast quantities of it lying on the hillside. We took a photograph of the sandstone, and I wish very much that we could spare time to examine the rocks more thoroughly. We may be able to do this on the way back. We have but little time for geological work, for our way is south, and time is short; but we found that the main rock is sandstone and on our way back we will collect some. It is gusty to-night, but beau­tifully clear. The altitude, according to the hypsometer, is 6,100 feet." When we got back to the ship, Professor David reported that some of the specimens were coal, and others "mother of coal." This sort of work continued day by day. "Almost up," I wrote on December 18th. "Altitude to-night is 7,400 feet above sea-level. This has been one of our hardest days, but worth it, for we are just on the plateau at last. Started at 7:30, relaying the sledges, and did 6 miles 600 yards, which means nearly 19 miles for the day of actual traveling. All the morn­ing worked up loose, slippery ice, hauling the sledges up one at a time by means of the Alpine rope then pulling in harness on the less stiff rises. Camped for lunch at 12:45 on the crest of a rise close to the pressure, and in the midst of crevasses, into one of which I managed to fall, also Adams. Whilst lunch was preparing I got some rock from the land, quite different from the sandstone of yesterday. The moun­tains are all different just here. The land on our left shows beautifully clear stratified lines, and on the west side sandstone stands out, greatly weathered. All afternoon relayed up a long snow-slope, and were hungry and tired when we reached camp. "We have been saving food to make it spin out, so that increases our hunger, and each night we all dream of food. We save two biscuits per man per day, also pemmican and sugar, eking out our food with pony maize, which we soak in water to make it less hard. All this means that now we have five weeks' food, while we are about 340 statute miles from the Pole, with the same distance back. We keep crevasses with us still, but I think to­morrow will see the end of this." Although I thought that we were almost on the top of the plateau, it was not until December 25th that we were really there. Even then we were kept climbing up more or less steep ridges. I will take the next extract from my diary for Christmas Day, the occasion to which we had looked forward with such keen anticipation on account of the proposal to treat ourselves then to a really good feed. "December 25th, Christmas Day," wrote. "Forty-eight degrees of frost, drift-snow, and a strong biting south wind; such has been the order of the day. Marched from 7 A.M. to 6 P.M. up one of the steepest rises we have yet done, crevassed in places. We are 9,500 feet above sea-level and our latitude at 6 P.M. 85° 55' south. We started away at 7 A.M. after a good breakfast, and soon came to soft snow, through which our worn and torn sledge runners dragged heavily. All morning we hauled along, and at noon had done 5 miles 250 yards. Sights gave us 85° 51' south. We had lunch then, and I took a photograph of the camp with the Queen's flag flying, and our sledge flags, and with my companions in the picture. "It was cold, the temperature being 16° F., and the wind went through us. All afternoon we worked steadily uphill, and could see, at 6 P.M., new land plainly trending to the south­east. Camped at 6 P.M., wind increasing. We had a splendid dinner. First hoosh, consist­ing of pony ration boiled up with pemmican, some of our emergency Oxo, and biscuit; then, in the cocoa water I boiled our little plum-pudding, which a friend of Wild's had given him. This, with a drop of medical brandy, was a luxury which Lucullus himself would have envied. Then cocoa, and lastly cigars and a spoonful of creme de menthe sent us by a friend in Scotland. "We are full tonight, and it is the last time we shall be for many a long day. After dinner we discussed the situation, and have decided to reduce our food still further. 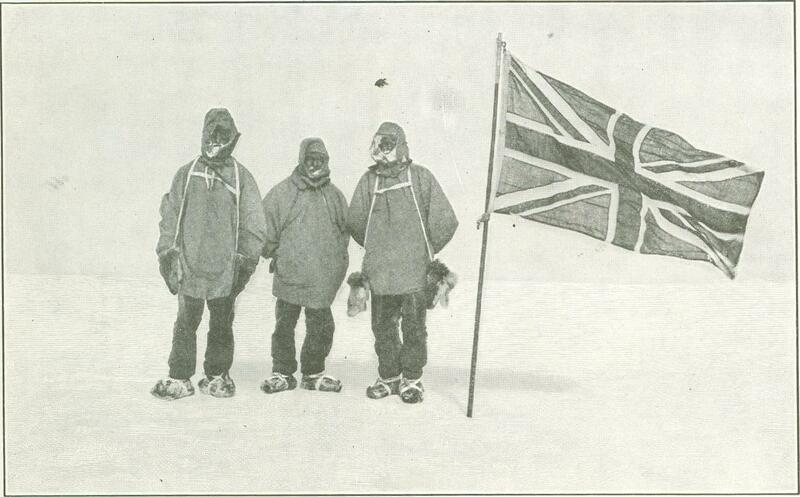 "We have now about 570 statute miles to do to get to the Pole and back to where we are at the moment, and we have one month's food and only three weeks' biscuits; so we are going to make each week's food last ten days, and have one biscuit in the morning, three at midday, and two at night. It is the only thing to do. Tomorrow we throw away everything but the most absolute necessaries. Already we are, as regards clothes, down to the limit. We must trust to our old sledge-runners, and dump the spare ones. One must risk this. Here we are away from all the world. Home thoughts are much with us today. . . . Mar­shall took our temperatures tonight. We are all two degrees sub-normal, but fit as can be. It is a fine, open-air life, and we are getting south." when we saw the small supply of food that had to sustain us through a march of ten hours. A strong blizzard wind still continued; indeed, throughout our journey toward the Pole, we had this wind in our faces. In the days that followed our Christmas feast we found our strength decreasing through weari­ness and lack of food. The ration was hardly sufficient to keep warmth in our bodies, and we felt the cold severely. On January 4th we were advancing over a vast snow-plain, with no land in sight, and, after a consultation with my comrades, I decided to risk leaving a depot of food and stores on the plateau. This lightened our load, but there was a serious danger that we might not be able to find the depot again in the waste of snow, and in order to guard against this eventuality as far as possible, we took the five bamboo poles from one of the tents, and stuck one up in the snow, with a black flag on top, at intervals of about twelve miles, to serve as guides on the way back. We were left with a load of 70 pounds per man, and in our weak­ened condition found more difficulty in dealing with this than we had with 250 pounds per man a few weeks earlier. We were making about twelve or fourteen miles a day. On January 6th we camped in a blizzard with high drift in latitude 88° 7' south. The wind rose during the night and for the next sixty hours it was blowing with a force of seventy or eighty miles an hour, the temperature at times being as low as 70 degrees of frost. 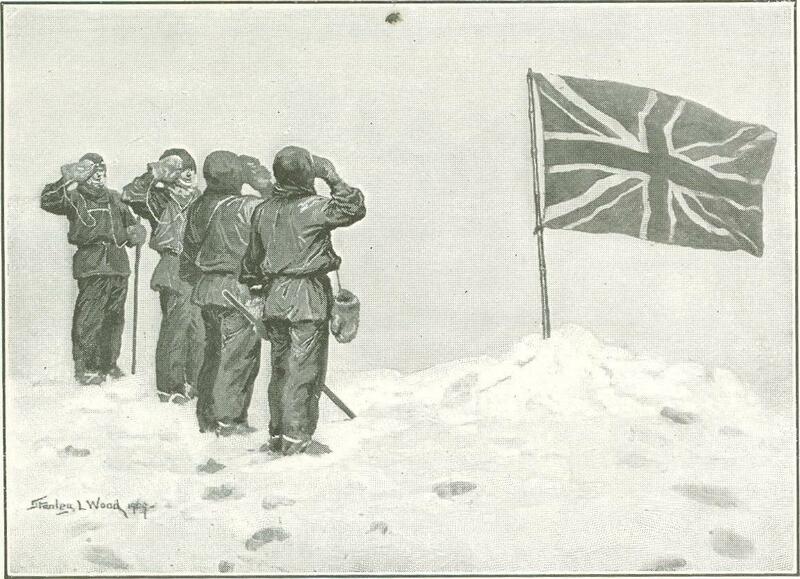 The situation was serious, for not only was our advance being stopped and our precious food disappearing, but there was doubt as to whether the sledge tracks and flags would remain to guide us back to the depot on which our lives depended. During that sixty hours we had many times to restore the circulation in one another's feet, for the temperature inside the worn and torn tent, which had now to contain the whole party, was just about the same as in the open air, and the snow drifted in all the time. As those dark hours went on, we prayed for a cessation of the blizzard, and at A.M. on January 9th it began to break. The blizzard had done its work, however, and we recognized that we had just about reached our limit. We got up at 2 A.M., and at 4 A.M. were away for a final march south, taking with us, nothing but food, instruments, and the Queen's flag, with a bamboo rod for a staff. Half running, half walking, we made that last march, and at 9 A.M., in latitude 88° 23' south, we hoisted the Union Jack. We could go no more, for to go farther meant abandoning all hope of getting back to our depots. The Pole, though only 97 geographical miles away, was impossible for us to attain. Before us stretched the same white plain over which we had traveled for many days; our powerful Goertz glasses showed no signs of land, and we could safely assume that the geographical South Pole was situated on this immense plateau, between 10,000 and 11,000 feet above sea-level, and certainly the coldest and one of the most stormy parts of the world. We took a photograph of the party, with the Queen's flag blowing out in the icy wind that cut us to the bone, took possession of the plateau on behalf of His Majesty, and immediately began the march back to our camp, our faces once more turned north. Originally published in McClure's Magazine in October of 1909.